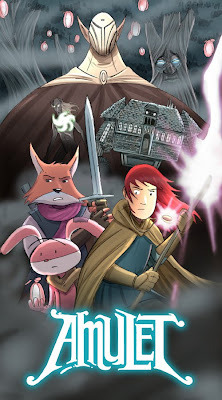 I was fortunate enough to be a part of the crew of people working on the sequel to this awesome graphic novel series: Amulet: The Stonekeepers Curse. I owe a lot to Kazu and his contributions to comics. He's been very kind to all of us who've helped him. The people I've gotten to know as a result to working on this has been a real added bonus. You guys are awesome and I hope I get to know all of you better. If you haven't read the series or are already a fan, let me tell you, book 2 is awesome. It's everything you'd hope for in a sequel to the first book. So, pick it up everybody! You sir, are the man. That is all.